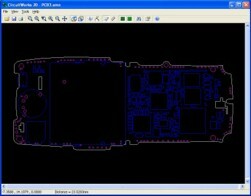 CircuitWorks 2D is a stand-alone viewer for IDF files, which allows the user to open, view and measure the PCB design without the need to purchase an ECAD system. CircuitWorks 2D is a stand-alone viewer for IDF files. IDF is a standard interchange format produced by many Electrical CAD systems that describes the size and shape of a Printed Circuit Board and the components on it. Priware's low cost viewer allows the user to open, view and measure the PCB design without the need to purchase an expensive ECAD system. It's ideal if you receive IDF files from a supplier for example, and wish to convert them into a 2D Mechanical CAD format such as AutoCAD or DXF. CircuitWorks 2D does not require any other 2D or 3D CAD system to operate, however if you have SolidWorks you might also be interested in CircuitWorks , which can produce 3D assemblies of PCBs from an IDF file. Supports the following IDF extensions .emn, .brd, .bdf, .idb and .panel. Shows the board outline, cutouts, drilled holes and components. Powerful find component feature to locate a component on the board. Save as AutoCAD Release 14, DXF, BMP or WMF format. Can show either the top or bottom of board. Measure distances on the board. Zoom and pan around the board. PC running Microsoft Windows 98 or higher with at least 128MB RAM.